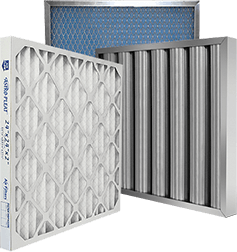 24x12x22 Rigid Flo-Pak 3-Pocket MERV 11 (65%) Extended Surface Pocket Surface Filter | Air Filters, Inc.
Air Filters, Inc.™ Flo-Pak™ Rigid Stiff Pocket ASHRAE 65% (MERV 11) Synthetic Bag Filters now utilizes an internal stitch design engineered to withstand demanding applications. Years of development and the highest quality raw materials available are combined to create manufacturing air bag filters unmatched in performance and value. The Flo-Pak™ Rigid Stiff Pocket extended surface bag filter was developed to provide dependable performance in commercial and industrial, VAV (Variable Air Volume) systems and turbine applications. Hospitals, manufacturing plants and office buildings can depend on Flo-Pak™ Rigid Stiff Pocket extended surface bag filter?s reliability in the protection of their HVAC equipment and occupants with low pressure drop by being unaffected by moisture or humidity. 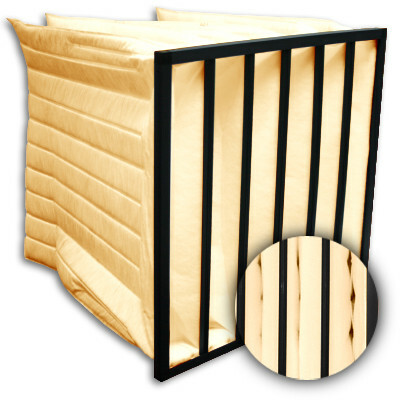 The rigid pockets prevent deflation of the pocket filtration area due to continuous changes in air flow volume resulting in complete utilization of the filter. The extended surface has a higher dust collection area that effectively doubles the filter life when compared to standard pocket filters. * ASHRAE 65% extended surface bag filter media is mechanically attached to a corrosion resistant header. * ASHRAE 65% extended surface bag filter with each component of the header combined to create a total system, design for maximum durability. * ASHRAE 65% extended surface bag filter shape of the pockets allows each one to fully inflate without touching the adjacent pockets. * ASHRAE 65% extended surface bag filter particulates are evenly collected throughout the entire depth of the filter, thus utilizing every square inch of media.